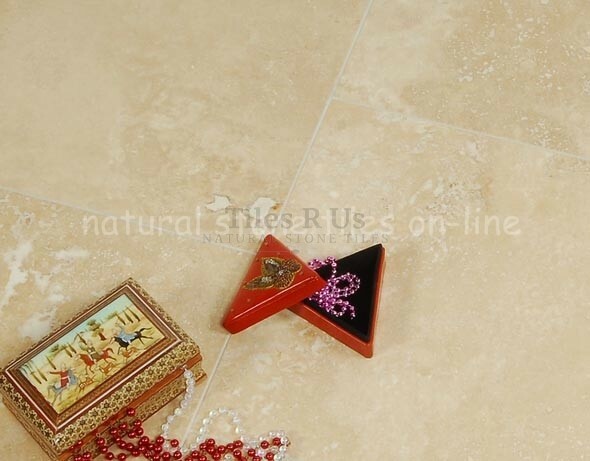 Price is per square metre of tiles (m2) Tile category: Travertine Honed & Filled Product Information:- Creamy, beige coloured; also known as medium light classic travertine. It is very consistent in terms of colour and very minimal variation occurs. The Roman Opus Pattern is a selection of tiles of different sizes that are laid in an authentic pattern just as the ancient stone masons would have laid them out. The Opus pattern is sold as square metres and the pattern repeats within each square metre, the Opus pattern shown below is a suggested layout - you can of course design your own layout to suite your preference and the design style you have planned for your rooms. WALLSTONE RANGE AVAILABLE! All Clasico tiles of 10mm thickness are ideal for use as wall tiles suitable for laying on PLASTERBOARD; the tile size has been selected to be ideal for walls. The reduced tile thickness means the weight per square metre remains below 32kg/m2 which is the limit specified in building regulations. This includes the weight of adhesive and grout.We suggest for this tile: Adhesive: Flexible standard set or fast set adhesives Grout: Flexible narrow joint grout or flexible wide joint grout Tile Sealer: Mattstone tile sealer Tile Cleaner: Grimex stone tile cleaner Tile Maintenance: Waxwash Click here to check our TILING ESSENTIALS including tile sealer, tile cleaner, tile adhesive and tile grout; we only supply carefully selected Tiling Essentials for Tiles R Us. Click here to check our NATURAL STONE TILING MADE SIMPLE guidelines and tips - Tiles R Us are unique and natural make sure you get the first step right and you will be very pleased with your stone tiles project. Under Floor Heating: Click here to see all the details and options available in our Comfy-Toes UNDER FLOOR HEATING range Warm comfortable feet - absolute heaven in your kitchen, bathroom, shower room or conservatory! Don't miss the chance to check our low cost, high quality range of floor heating systems.